Built in 1892 by Thomas Toler Jr., the classic Queen Anne home of Carolyn and Homer Ed Barousse features a sweeping front porch with a large turret, Doric columns, balusters, spindles and turned posts. As one of the oldest residences in Crowley, it is a stunning example of a bygone era. Located on an acre lot in the middle of the city, the 5,000-square-foot home is a showplace that has been pristinely maintained by the Barousses since they purchased it in 1975. “I am from Crowley, and I always admired the house, so we couldn’t pass up the chance to purchase it when it went on the market,” explains Homer Ed, an attorney with his law firm of Barousse and Craton, Attorneys at Law. “We saw it as a wonderful, spacious home in which to raise a family, and it has been a privilege to be the caretakers of such an historic home for 40 years,” adds Carolyn, a speech language pathologist. 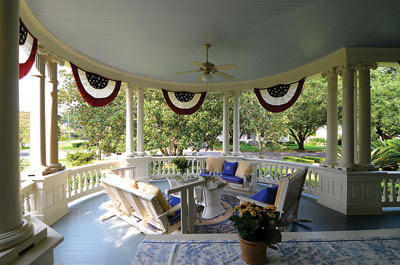 The circular porch showcases the Doric columns. Both the ceiling and floor are painted blue. Comfortable seating is provided for entertaining. White wicker furniture placed on a sisal rug creates a second entertaining area on the front porch. BOTTOM: Built in 1892, the classic Queen Anne-style home of Carolyn and Homer Ed Barousse is one of the oldest homes in Crowley. A statue graces a pocket garden where caladiums are featured in the center raised flowerbed. Carolyn’s niece, Caroline Renfro Flettrich, ASID Allied Member and partner in Richard-Renfro Designs in Baton Rouge, helped with the couple’s most recent renovations. “Caroline has a feel for our home because of all of the time she spent here throughout her life,” Carolyn says. The couple credits Michael Washington, their longtime gardener, for keeping their yard beautiful year-round. “We have wonderful memories of the happy times and many celebratory events that have taken place in our home with our five children, their spouses, our grandchildren and our many friends who have celebrated the joys of our lives with us. 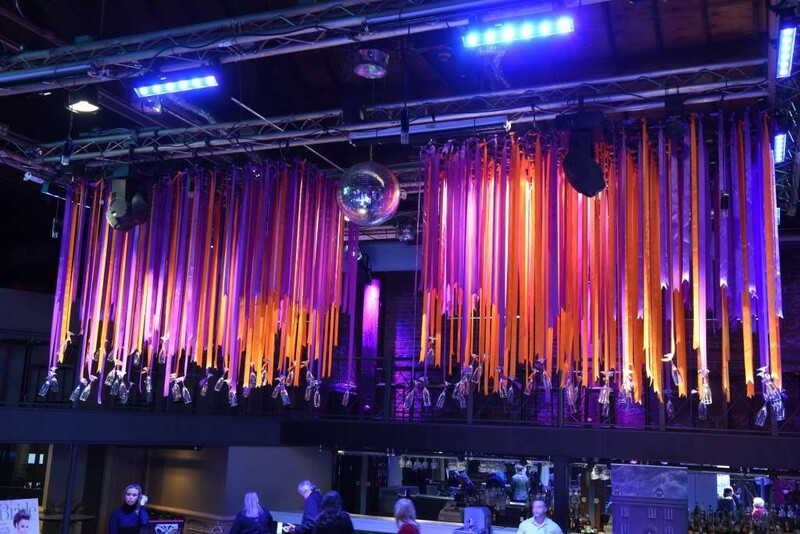 Our family has celebrated countless christenings, birthdays, swimming parties, large teenage events, engagement parties and even wedding ceremonies and receptions,” says Carolyn. The kitchen offers a homey flavor to the house, although it has all the modern appliances. The five-arm brass Victorian chandelier was purchased from an antique dealer in Baton Rouge in 1975, the same year the Barousses bought the house. The portraits are of Barousse’s three sons – Charles, Edward and William – all taken when each one was 5 years old.